After it was baked and cooled I used a picture that I had taken of a site and outlined the snowman on parchment paper and put it in the freezer while I was getting everything else ready. I then frosted the top of the cake in green icing and proceeded to put the outline on the cake. I then used a size 16 tip to fill in all the colors. 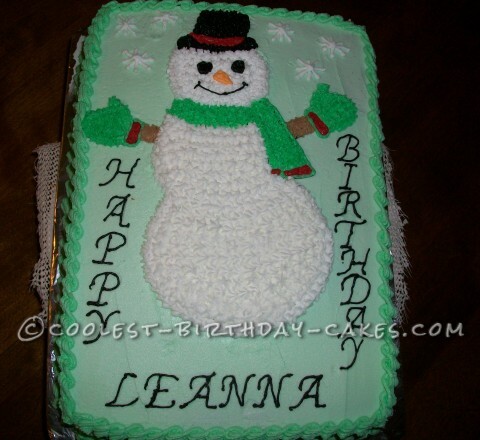 My only problem was that I had outlined the cake in black and then I decided that a black outline didn’t look so good on a snowman so I just did an extra round of icing to cover in the black and it looked pretty good. The little girl liked it and that’s all that matters when I do a cake for someone.